And, today’s YA author in the spotlight is: Jenny Torres Sanchez. Enjoy! Before writing her debut novel, THE DOWNSIDE OF BEING CHARLIE, Jenny Torres Sanchez studied English at the University of Central Florida and taught high school for several years in the Orange County school system. Her students were some of the coolest, funniest, strangest, and most eclectic people she’s ever met. She’s grateful to have taught every single one of them and credits them for inspiring her to write YA. Jenny also writes short stories–many of which rooted in her Hispanic culture. She currently writes full-time and lives in Florida with her husband and children. In addition to writing, she likes to paint, take pictures, and listen to music. Her taste ranges from The Smiths to Violent Femmes, to the Beastie Boys, to Lila Downs, to a band called Los Tigres del Norte. DESCRIPTION FROM THE BOOK JACKET: Charlie is handed a crappy senior year. Despite losing thirty pounds over the summer, he still gets called “Chunks” Grisner. What’s worse, he has to share a locker with the biggest Lord of the Rings freak his school has ever seen. He also can’t figure out whether Charlotte VanderKleaton, the beautiful strawberry lip-glossed new girl, likes him the way he likes her. Oh, and then there’s his mom. She’s disappeared–again–and his dad won’t talk about it. MY TWO CENTS: Charlie is a high school senior who is returning to school after having shed thirty pounds but few of his social insecurities. He has a hip best friend, a crush on the hot new girl (who is not good enough for him, in my opinion), a mom who is mentally unstable, a distant dad who is having an affair, and a caring photography teacher who helps Charlie develop his talent and find something good about himself. He also has an eating disorder. He binges and purges in an effort to feel better during highly emotional moments. There’s a lot going on in the novel, but Sanchez does a good job of blending the issues and capturing a struggling male teen’s voice. If anything, I wanted more of the bulimia issue. It’s rare to see a male MC in a YA novel with an eating disorder; it’s worth exploring even more. TEACHING TIPS: English teachers could obviously pursue themes, characterization, and external and internal conflicts, but this novel also has great cross-curricular potential. An art teacher wouldn’t have to read the entire novel with a class, but could pull out and explore the chapters that deal with Charlie’s photography and how it helps him to address what’s going on in his life. Students could create a similar photography project. Also, health teachers could use parts of the novel to address eating disorders, bulimia in this case. Mixing non-fiction with fiction is a good way to engage students in such topics and fits right into the Common Core State Standards. LINKS for more information: Find THE DOWNSIDE OF BEING CHARLIE on Amazon.com, Barnes and Noble.com, IndieBound.org, and Goodreads. 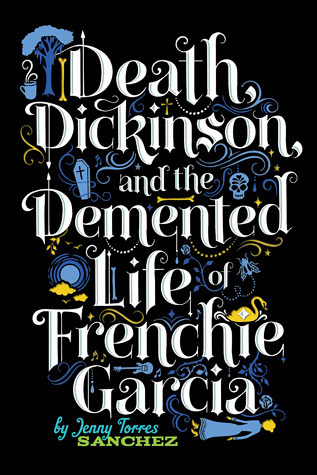 Jenny Torres Sanchez also has a new novel being released soon, on May 28, 2013, called DEATH, DICKINSON, AND THE DEMENTED LIFE OF FRENCHIE GARCIA. I’ll be sure to check this one out!